NOTE: вЂў If the doors unlock or lock with the transmitter, but the LED on the transmitter does not come on, the LED is faulty; replace the transmitter. вЂў If any door is open, you cannot lock the doors with the transmitter. Opening the trunk does not cancel this function; only an open door signal cancels the automatic relock. вЂў If you unlocked the doors with the transmitter, but do not open any of the doors within 30 seconds, the doors relock automatically. вЂў The doors do not lock or unlock with the transmitter if the ignition key is inserted in the ignition switch. 1. Press the transmitter Sock u . unlock button at least 1 times to reset the transmitter. вЂў If the locks work, the transmitter is OK.
вЂў If any of the transmitter buttons do not work, replace the transmitter, then register the new transmitter (see page 22-439). вЂў If the locks don't work, go to step 2. 3. Select KEYLESS TRANSMITTER from the BODY ELECTRICAL menu, next select inspection then select INSPECTION, then KEYLESS CHECK. 4. Follow the screen prompts to check each button's operation. вЂў If KEYLESS ENTRY TRANSMITTER CODE RECEIVED is indicated, the transmitter is OK.
вЂў If DIFFERENT KEYLESS ENTRY TRANSMITTER CODE IS RECEIVED is indicated, the transmitter is working but not registered to the vehicle. If necessary, register the transmitter (see page 22-439). вЂў If KEYLESS ENTRY TRANSMITTER CODE IS NOT RECEIVED is indicated, go to step 5. 5. Open the transmitter, and check for water damage. вЂў If you find any water damage, replace the transmitter, then register the new transmitter (see page 22-439). вЂў If there is no water damage; go to step 6. 6. Replace the transmitter battery (A) with a new one, and press the lock or unlock button and check the response on the screen of the HDS. вЂў If KEYLESS ENTRY TRANSMITTER CODE IS RECEIVED is indicated, the transmitter is OK.
вЂў If KEYLESS ENTRY TRANSMITTER CODE IS NOT RECEIVED is indicated, go to step 7. 7. Use a different known-good keyless transmitter assembly and repeat steps 3 and 4.
вЂў If DIFFERENT KEYLESS ENTRY TRANSMITTER CODE WAS RECEIVED is indicated, replace the keyless transmitter and do the immobilizer system registration (see page 22-439). вЂў If KEYLESS ENTRY TRANSMITTER CODE WAS NOT RECEIVED is indicated, the immobilizer-keyless control unit is faulty, replace it and do the immobilizer system registration (see page 22-439). NOTE: The keyless transmitter is combined with the immobilizer transponder, so when the transponder is registered by the HDS, the keyless transmitter programming is completed automatically. 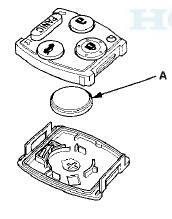 В® If the engine does not start, go to the immobilizer system troubleshooting (see page 22-431). вЂў If the engine starts, go to step 2. 2. Press the transmitter lock or unlock button five or six times to reset the transmitter. вЂў If the locks don't work, go to step 3. 3. Open the transmitter, and check for water damage. вЂў If you find any water damage, replace the transmitter and register the new transmitter. m If there is no water damage, go to step 4. 4. Replace the transmitter battery (A) with a new one (CR1616), and try to lock and unlock the doors with the transmitter by pressing the lock or unlock button five or six times. вЂў If the doors lock and unlock, the transmitter is OK.
вЂў If the doors don't lock and unlock, go to step 5. 5. Reprogram and register the transmitter (see page 22-439), then try to lock and unlock the doors. вЂў If the doors don't lock and unlock, substitute a known-good transmitter, register it and recheck (see page 22-439). 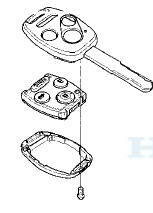 If still not operating, replace the immobilizer-keyless control unit.